The lifestyle of this new century demands creating environments with spirituality. The loss of values in the real estate sector, where the importance is centered on the economic aspect, has generated the proliferation of apartments that seem like a small urns, where instead of enjoying life, people die a bit every day. Rescuing the intrinsic qualities of the housing is a priority that must face seeking what is simple, essential and pure. When we find a space that is habitable and pleasant, and we feel attracted by its beauty, independent from its style or aesthetics, in that moment we contact the spirituality of the place, that reflects our quest for peace, of identifying with something that protects us and at the same time that invites us to live. Projecting a space is a fascinating task. The information era has definitely influenced the creation of a new lifestyle, where we have to be careful to not getting lost, and above all, not to loose the perspective of a better quality of life. It is important that design evolves towards something practical, flexible, where different activities and expressions reunite, that adapts to the different personalities of its users, but fundamentally, it has to be deep and has to achieve a spirituality that can balance the chaos of our times. We have to return to the essential values of a household. Having peace, a calm refuge, is a luxury nowadays. Life habits that really belong to us, and not those imposed by society, are reflected in a better distribution f space. This will help to articulate and optimize the areas as a whole, and even more important, to contribute to define a space that belongs to its inhabitants. The architect or designer must not limit himself to a functional and formal response. It is a priority to provide solutions or new proposals that can improve clients’ lifestyle. In order to achieve this, the designer must acquire knowledge beyond the limits of architecture, to be capable of offering a really significant input. Afterwards, the proposals of furniture, materials, finishes, textures, colors will be developed, that will help defining new spaces. Having access to all those elements, independently from their origin, is easier at present thanks to the possibilities offered by globalization. 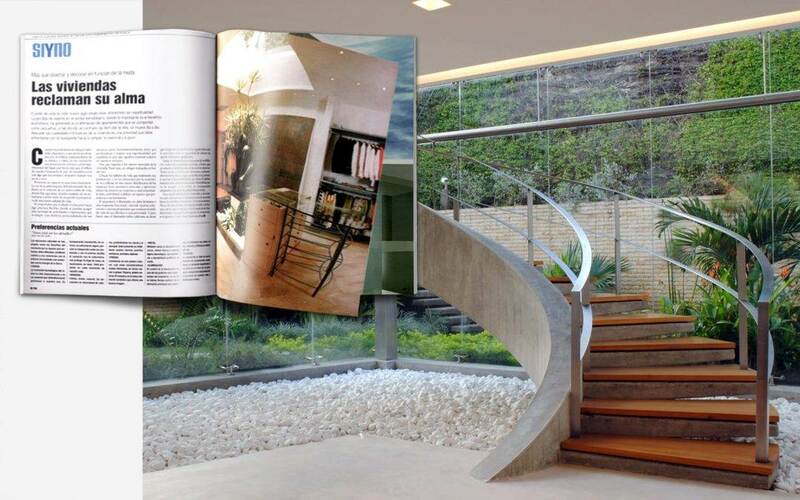 This allows more flexibility for the image and is reflected in budgets adapted to the individuality of the project. Materials and elements that represent the current tendency, point towards simplicity, purism and minimalism. But, in the end, style or shape with which people decide to live don’t matter, what is really fundamental is the spirit of the space. What is important is to generate live homes, homes with souls. The technological evolution of glass has been impressive and it is a material that definitely belongs to our era. It is transparent and translucent, colored, structural, light, it allows integration of areas and with the exterior, it facilitates contact with nature, it protects us. It is the top of the table, the hand wash basin, a glass. It is present in every moment of our lives. Warm, noble, natural. It can be found in diverse colors, preferring light ones and wenge. It is present in furniture, floors, ceilings, doors, windows, walls, pencils. Limestone is a natural stone, with fabulous matte features, in light or gray tones. Slate, natural stone. Mosaic is the only ceramic element that offers a good image. Metals such as aluminum or steel have strength and a light aspect, technological. Its resistance and durability justify its cost. Controlling lighting is one of the most important powers of an architect. Light is at the same time shadow. It is the main element to generate an environment with a soul. Light, natural and artificial, is always light. Vegetation, although it is not a construction material, is an important element to consider in a project. It includes nature directly in our lives and brings peace to our soul.